Real name Douglas Baker, Ox began wrestling back in the early 60s and by the late 60s was already appearing for the WWWF. His 6’5 350 pound frame undoubtedly made him an instant attraction which undoubtedly played a role in him appearing across the country as well as Puerto Rico during the territory days. 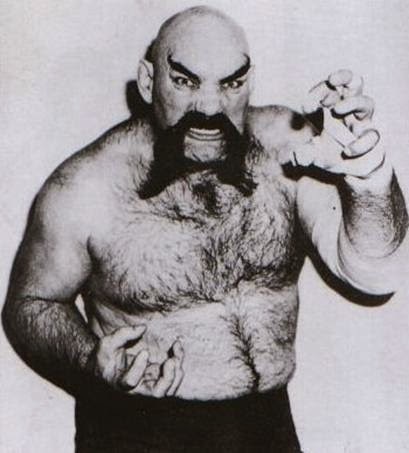 Ox was the type of wrestler that I personally loved because he truly did have a character and an intriguing look; one look at Ox Baker and a wrestling fan’s imagination could run wild about this scary monster looking guy stepping in the ring against a variety of opponents. While not the most technically sound wrestler, that was part of the intrigue personally; do we need to see a 6’5 350 pound monster like Ox Baker doing technical moves? Or was it more intriguing to see this monster brawler up against a technical guy or even another brawler just to see what would happen especially if he unleashed his dreaded “Heart Punch”….I miss that thought process in wrestling. You may also recognize Ox from a few movies as well, most famously “The Big Brawl” with Jackie Chan and “Escape From New York” with Kurt Russell – it was really no surprise that Ox transitioned to acting being his look makes for the perfect bad guy in just about any realm. Ox also had a memorable appearance on “The Price is Right” with Bob Barker that is definitely worth watching if you’re an Ox fan. Ox Baker lived a full 80 years of life, and it was great to see Ox was still making regular appearances at independent shows and autograph conventions even in the past few months. As an old school fan, I have always appreciated Ox Baker as a true character the likes of which we rarely see these days in wrestling. You show me a big monster with a crazy look like Ox Baker, and I want to see that guy wrestle…simple as that. Be sure to join us in our Google Plus Community where we will be enjoying some classic Ox Baker moments and matches, and you can feel free to share your own as well! JBL’s Smackdown Annoucing Replacement Is…. More on WWE’s Cryptic Viral Campaign, and possible Jericho return!